Each was individually made over an open flame, so no two are exactly alike. They are all quite beautiful and all in perfect condition, despite their advanced age. Each is approximately 22mm in diameter, with half the bead worked in amber glass and the other in topaz. I've spaced these with vintage Swarovski crystal Madeira topaz aspirin beads, and closed the 8" strand with a vintage gold plate diamante clasp. 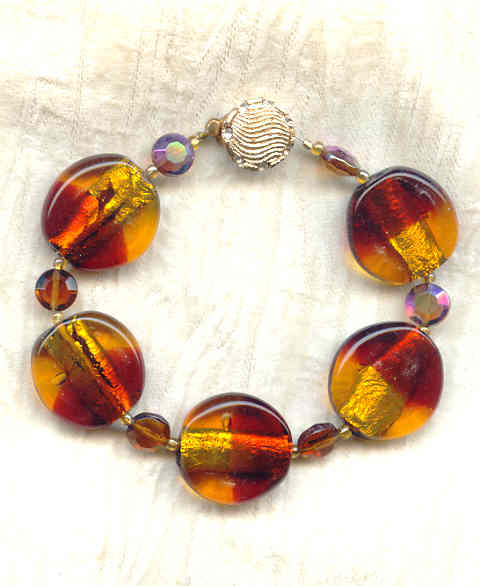 This spectacular bracelet is brought to you by SPARKLE PLENTY. The vintage West German crystal drops are a beautiful golden topaz colour with machine cut vertical facets that give them a very art deco look.